Alvernia offers a values-based educational approach that challenges students to grow into ethically courageous leaders for life. With hundreds of community connections and opportunities for service learning, Alvernia students impact their communities while earning their degrees. • Enrollment: About 3,000 students are enrolled; almost half the student population are undergraduates. • Faculty: Alvernia has a 12:1 student-faculty ratio and an average class size of fewer than 20 students. 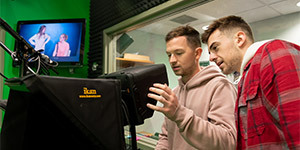 • Student Activities: More than 55 student groups are available, including intramural and intercollegiate sports, academic clubs, honor societies, student government, and service clubs. • Affordability: About 98% of undergraduates receive some type of financial aid. About 40% of Alvernia undergraduates are student-athletes. Continuing a proud athletic tradition, Alvernia is a member of the Commonwealth Conference of the Middle Atlantic States Collegiate Athletic Corporation (MAC), a highly competitive NCAA Division III conference. Alvernia offers a range of academic programs that transform students into leaders ready to pursue fulfilling service-oriented careers. With more than 600 courses and 50 majors and minors in nearly every field, an Alvernia education will prepare you for the career you want—and the one your community needs. As one of only 24 Franciscan institutions in the United States, our values-based learning philosophy is guided by the ideal of “knowledge joined with love” that shapes our educational philosophy and strong campus community. Our emphasis on developing ethical leaders with moral courage is blended with a commitment to service in a campus environment that provides our students the ideal setting to grow and develop. Alvernia students live the Alvernia motto, “To Learn, To Love, To Serve,” every day as they learn through service. By working with underserved populations, our students fully understand the challenges facing our world. Through our community connections in Berks County, Pennsylvania, and beyond, Alvernia students get experience in their fields of study while they serve others. Through Alvernia’s Holleran Center for Community and Global Engagement; the O’Pake Institute for Ethics, Leadership, and Public Service; and Alvernia Campus Ministry, Alvernia students learn to lead as they create positive social change. For example, Alvernia students travel to teach and serve at the Bernardine Franciscan Sisters’ school in Santo Domingo, Dominican Republic. They also complete service projects locally through the South Reading Youth Initiative and the Reading Collegiate Scholars Program, which pairs Alvernia students with Reading High School students for mentoring opportunities. Service is even built into Alvernia’s curriculum. Past service learning courses have allowed Alvernia students to provide social media marketing to a local women’s shelter, help a local author promote her anti-bullying initiative, and give physical therapy services to children in need. An Alvernia education is affordable—our tuition is well below the national average for private liberal arts colleges. The Alvernia Office of Student Financial Planning works with students to find the best ways to fund their education through scholarships, grants, work-study positions, and loans. About 98% of Alvernia students receive some type of financial aid. Our students experience a great return on investment. About 95% of Alvernia students are employed in their fields or enrolled in graduate programs within six months of graduation. Graduates work in education, health care, social services, large and small businesses, the media, law firms, law enforcement, all levels of government, and many other professions and fields. Whatever your extracurricular interests, Alvernia will help you live your whole life—mind, body, and spirit. Students join service organizations like the Bog Turtle Creek Farm, which brings naturally grown produce to the city of Reading. Other groups, like the InterVarsity Christian Fellowship, allow students to explore life’s enduring questions and experience other students’ faiths. In addition, many Alvernia campus clubs coincide with academic majors, so students can attend conferences and network with professionals in their fields before graduation. You can’t pour from an empty cup. 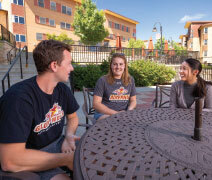 Alvernia students recharge and thrive in their spacious and clean accommodations on campus. With views of Mount Penn and the Reading Pagoda, Alvernia on-campus housing is designed to support students on their way to successful careers. Our Village Apartments feature contemporary-style housing and offer the latest amenities, including gas fireplaces in atriums and business centers for student use. 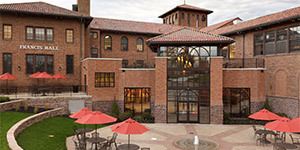 Alvernia also offers special-interest housing options for students who seek a supportive living-learning environment. Our scenic 121-acre campus in historic Berks County is three miles from the heart of Reading, Pennsylvania, and a short drive from Philadelphia, New York, Baltimore, and Washington, DC. The beautiful Blue Marsh Lake is close to campus and offers biking, hiking, kayaking, swimming, and more. Hawk Mountain Sanctuary, French Creek State Park, and plenty of great golf courses are also nearby.